GF Machining Solutions (a division of Georg Fischer) and Sensofar Metrology (a division of Sensofar-Tech, SL, based near Barcelona, Spain) have agreed to a new strategic partnership. Effective immediately, Sensofar Metrology will supply GF Machining Solutions with custom S line (S neox) surface metrology systems, to be used for the development of advanced nano-texturing methods. These methods utilize ultrashort pulsed laser, EDM and/or other micro- and nano-manufacturing technologies for the production of technical surfaces that exhibit precise functional characteristics, or that meet specific aesthetic requirements. 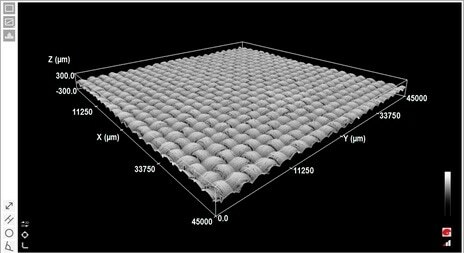 Carbon matting surface replicated using an ultrafast laser system. The move to the Sensofar S line platform in part follows GF Machining Solutions’ adoption of ultrashort pulsed (ultrafast) laser technology for micromachining. The new metrology systems are needed, first, to reverse engineer natural surface textures down to the nano-feature level and, second, to chart the production process – from the micromachining of the mold through to the degree of replication achieved in the molding process – of artificial surfaces manufactured with these textures and other features. This new strategic partnership supersedes a previous and similar agreement with a supplier of focus variation (FV) 3D metrology systems. FV is a well-regarded technique where sufficient surface roughness and structure are present. Nonetheless, for achieving higher precision acquisition, and for the more advanced surface texturing approaches currently under development, a more versatile metrology tool is essential. Sensofar’s S neox, the system platform at the core of the partnership, provides three complementary measurement techniques – confocal, interferometry and FV – in a single sensor head. This translates into unrivaled measurement versatility to explore new micro- and nano-texturing approaches across more diverse scales and structures. For consistency, reproducibility and benchmarking, measurement reports will tie in to the 3D surface texture parameters defined within the ISO 25178 norm, a standard feature of Sensofar’s metrology systems. The S neox systems associated with this agreement further include custom hardware and software changes. Finally, to demonstrate the capabilities of the metrology systems to potential customers of both organizations, GF Machining Solutions and Sensofar have agreed to co-exhibit at a suite of key trade events and workshops in automotive, optical, medical, micromachining, semiconductor and various other industry sectors. Any GF-qualified Sensofar systems sold as a result of the strategic partnership will be delivered and supported through Sensofar’s existing global network of distribution and service channels.